LINE, COLOR and PATTERN are the main tools used in these paintings to create optical illusions or hidden pictures. The LINES of snow in the rocks blend with the lines of white on the horses in Pintos. The SHAPES of color on the horses are the same as the rocks behind them. 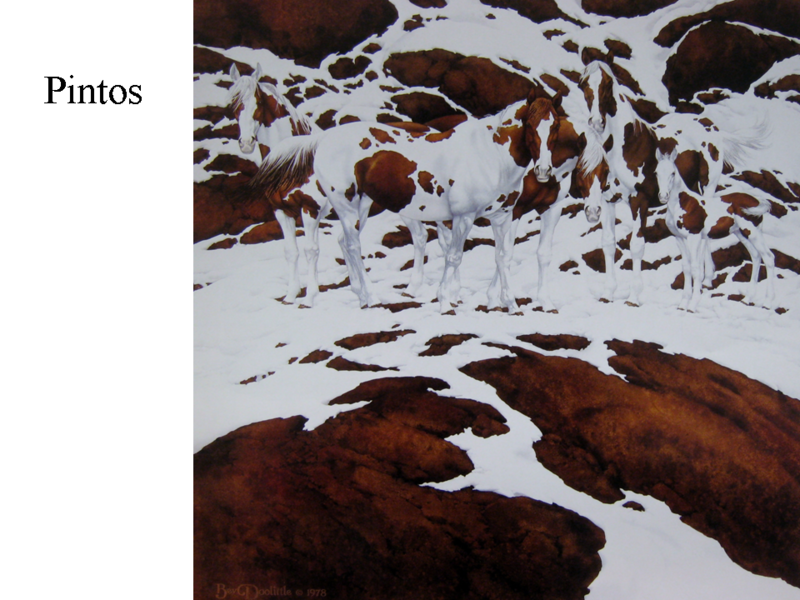 By using the same LINES, COLOR, SHAPES and PATTERN on the horses as in the background, Bev Doolittle hides the Pintos in the picture and we have to look hard to find them. 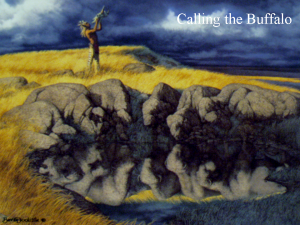 Calling the Buffalo at first seems like a simple landscape. The HORIZON LINE is easy to see. The dark shades of COLOR in the sky help create a MOOD in this painting. 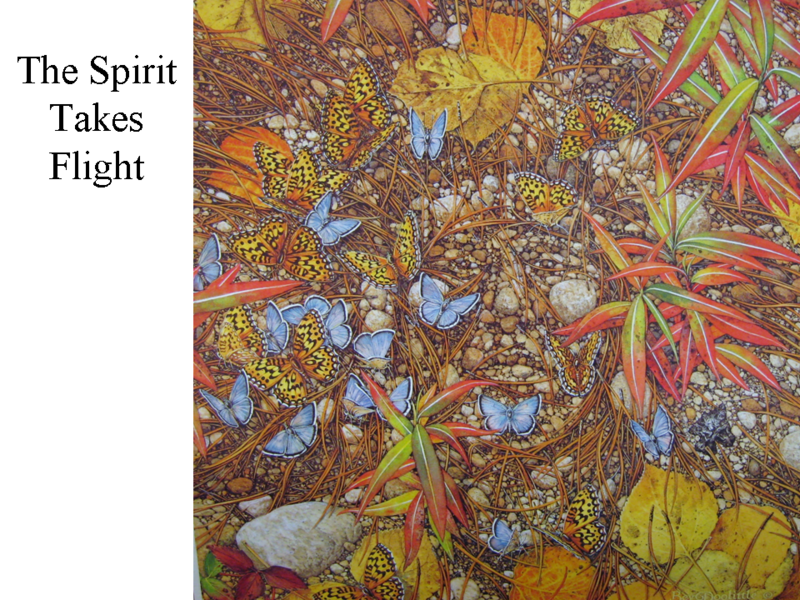 The Spirit Takes Flight is full of TEXTURE. 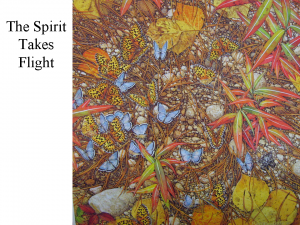 After studying the picture, the viewer can finally see how the textured ground cover has been arranged to camouflage the face of a Native American warrior. In Bugged Bear the artist has so finely detailed the TEXTURE of the bear’s coat that it seems as if we can pick out each individual strand of fur. Point out the fact that this is VISUAL TEXTURE, not actual texture. Bring in a small piece of animal fur and let the kids feel it to understand how the artist fools our eyes to make us believe that what we see is ACTUAL TEXTURE. Bev Doolittle was born and raised in Southern California. She describes her childhood as “ordinary”. Bev grew up in a large family with parents, step parents, two sisters, a brother, a step brother and two half brothers. One sister was three and a half years older than Bev. This sister always got to color all the Disney characters in their coloring book because she declared that she was the best coloring artist, over her three younger siblings. Since Bev’s older sister “hogged” the coloring book, Bev started drawing her own pictures to color and her favorite subjects were horses. Bev Doolittle’s mother said, “Bev literally could draw as soon as she picked up a pencil. Even before she went to school, she had started drawing horses and people.” Bev won her first award at the age of twelve, in an art contest sponsored by the San Gabriel historical Society and Bev’s first one-artist show was held when she was 14. Her high school art teacher suggested that she apply for the Saturday Scholarship at the Los Angeles Art Center College of Design; she won the scholarship and began serious art study even before graduating from high school. After graduating from high school, Bev enrolled full time in the Art Center College of Design, majoring in advertising illustration so that she could earn a living while doing her painting. Bev studied photography, painting, drawing and illustration. Because she was preparing for an advertising career, much of her time was spent drawing objects that might one day appear in an advertisement. Yet, whenever she had time to just let her pencil roam, it would draw horses, which are still her favorite subject. What kinds of objects can most commonly be seen in an advertisement? Soap, toilet paper, paper towels, household cleaning supplies, make-up, fashions, jewelry, fashion accessories, groceries, toys, cars, furniture, shampoo, vacuum cleaners, etc. Bev met her husband, Jay Doolittle, while attending school at the Art Center. Jay was also a very talented artist, who graduated from the Art Center with honors, in 1967. Bev and Jay married in 1968 and, since they both loved to paint outdoors, their honeymoon was a painting trip to Zion National Park, in Utah. Bev and Jay see themselves as two different kinds of artists. Jay often helps Bev by discussing the concept of a painting with her and helping her with research for it. The Doolittles originally sold their paintings at outdoor art shows much like Portland’s “Saturday Market”. As Bev’s paintings became increasingly ambitious and detailed they would take longer and longer to finish. This meant that Bev needed to ask higher prices than they could get at the outdoor art shows, which at that time were the Doolittle’s’ only sales outlet. Because they needed to make money, the couple came up with “You and Me” paintings, which didn’t take as much time. For these paintings, Jay would paint a watercolor background and Bev would add a small, very detailed animal, Indian or mountain man. They would both sign the paintings, which sold well, but it wasn’t enough money to pay all their bills. Jay took a job in an advertising agency and Bev worked as an independent illustrator. She did a series of illustrations for the Police Safety League. Illustrating other people’s ideas wasn’t what Bev or Jay really wanted to do with their talents. They also didn’t want to keep living in a big city, so they decided to quit their jobs (which meant they wouldn’t have the security of a monthly paycheck) and start a new life as Traveling Artists. In 1973, the Doolittles decided on a year-long experiment to see whether or not they could make their living solely as painters. They had little interest in material possessions or fancy traveling, so the Doolittles bought a secondhand, 1957 Chevy pick-up truck, which they fitted out as a camper. It was just big enough for their bicycles, a cook stove, a tent, their photographic and painting equipment. Jay built a small platform on top of the camper so that they could paint in the open air, out of the way of bears and people. They often sold their paintings right on the spot as people watched them painting. The Doolittles drove all around the American West, looking for creative ideas to paint. During this time, Bev became more and more interested in the history and mystical aspects of the Native Americans. She began researching Native Americans and slowly these images found their way into her paintings. When the year was over, the Doolittles decided they would try and make it on the own as Fine Artists. They had to find more ways of selling their paintings and began to participate in various Art Shows, fairs and festivals around the United States. In order to do this, the Doolittles had to live in a 22-foot trailer, in Jay’s parent’s backyard. Bev drew inspiration from the photos, memories and dozens of sketches she and her husband had collected during their year of traveling. It was at this time that Bev began to develop her own famous style of painting. Bev Doolittle’s unique style of painting has made her a very famous artist today. Bev creates large, complex, highly detailed watercolor paints which take weeks, even months, of planning, research, drawing and painting. Her STYLE is characterized by meticulous REALISM, unsparing attention to detail and an extraordinary talent for drawing. Many of her works tell a story. Her storytelling captures the viewer’s imagination and makes us look closer to find the details. Because of the complexity and time it takes to make one of these paintings, she needed to ask a much higher price, so the Doolittles began searching for an Art Gallery that would handle Bev’s higher priced works. Bev and Jay had a son, named Jason, who was born in 1981. Today, the Doolittles are busier than ever. They live way out in wild canyon country. 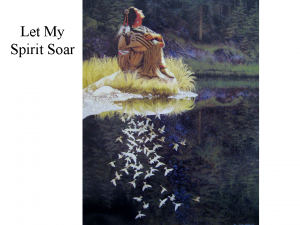 Bev’s paintings, depicting Native Americans, have won the support of many Native American Tribes. Bev Doolittle’s paintings have a magical quality that can be appreciated whether or not the viewer likes Western or Native American art. Her paintings create an irresistible involvement with the viewer. That is why Bev Doolittle is so hugely successful today! She is an artist who reaches out to everybody and touches their imaginations! In 1979, Bev Doolittle completed a painting called Pintos, which changed her life forever. This painting first started out to be a group of chestnut (brown) horses in a green meadow. But Bev wanted something more dramatic in her painting so she changed the meadow into a rocky pass, the horses became dappled Pintos, and she added a sudden snowfall. 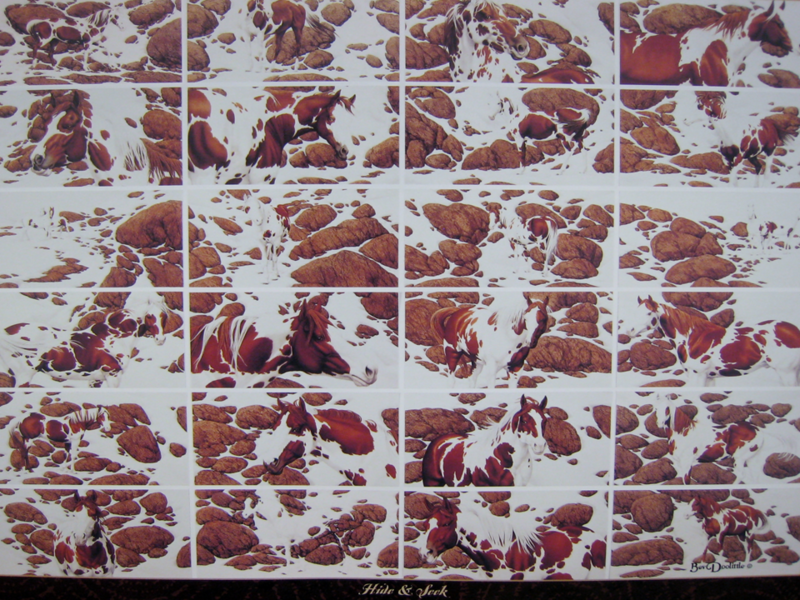 In doing this, Bev Doolittle found herself in a brand new territory—“Camouflage Painting”. Sometimes, while she was working on this painting, Bev would get lost in the painting so she developed the technique of using tissue overlays to find her way around in the painting. (Bev demonstrates this technique in her video.) With her Pintos picture, Bev Doolittle had truly found herself as an artist! Bev submitted Pintos to the American Watercolor Society for possible exhibition in New York. It was here that this painting caught the eye of the President of the Greenwich Workshop. Pintos was released as a limited edition print. This means that only a certain number of copies from the original watercolor painting could be printed and sold to the public. The originals were priced at $65 and only a thousand prints were made. 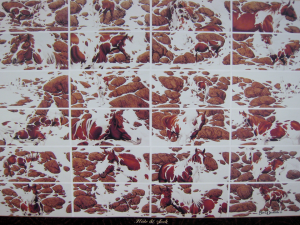 By 1989, a Pintos print sold for $10,000 and the “Bev Doolittle phenomenon” took off! Today, each set of limited edition prints completely sells out as soon as it is released. 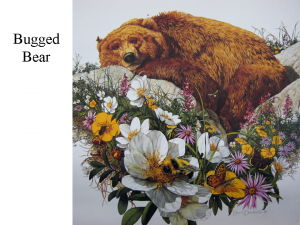 An original Bev Doolittle watercolor will easily sell for $150,000 or more! Over 500,000 copies of her two art books, The Art of Bev Doolittle and New Magic, have been printed and, through partial proceeds from the sale of her prints, significant environmental causes have received donations in the hundreds of thousands of dollars. Bev’s latest book is titled The Earth is My Mother. Draw horses and paint or color them like dappled Pintos. Draw a horse’s head only (close up view) and paint with Pinto spots. Draw horses in a meadow or a wild landscape. Sculpt a horse FORM using pipe cleaners or thin wire. Display the example of sculptor Debra Butterfield’s horse sculpture. Deborah assembles her various horse sculptures using wood, scrap steel or other “found objects”. This type of sculpture is called an ASSEMBLAGE. Sculpt a horse using craft sticks, toothpicks, twigs, and scraps of wood glued together. Draw and cut out a large horse SHAPE, from white construction paper. Cut and glue the details, like hooves, mane and dappled spots, from colored construction paper. Begin with the project above, but cut details using unusual and unexpected COLOR or PATTERN. How about a purple spotted pinto with a flowing pink mane and tail? This ASSEMBLAGE sculpture was formed using smooth tree limbs and driftwood. The Portland Art Museum owns a Deborah Butterfield horse sculpture, similar to this one, created from willow branches with the bark removed. There are three more Deborah Butterfield Horse sculptures, near the Portland Airport, just off Airport way. A thousand years before Columbus discovered it. We call them Native Americans. They call themselves The People. They were scattered like leaves. Where they walked softly, cities roar. We can never be alone. Someone who loved this land watches over it. Can you see the faces in the forest watching you? 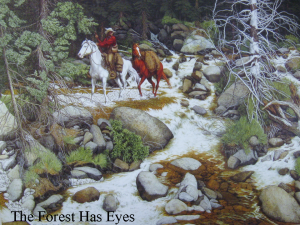 This is one of Bev Doolittle’s famous camouflage paintings. Can you find the faces hidden in the forest? How many can you find? (Check the diagram on the back of the picture.) To find the faces, you need to look at this picture carefully and study it for a long time. What is the man in this painting doing? He is crossing a river, riding a horse, pulling another horse behind him (possibly with or for more provisions). The man has a rifle in his right hand and he is looking behind him. What do the details of this painting tell you about the man? (Grade 3) Write a paragraph about what the man in this picture is thinking. Is he worried or scared? Did he just hear something behind him? Did he see something behind him? Could it be an animal? A person? His imagination? Is he just looking for his friend who has fallen behind? Why is this man in the forest? Is he hunting for food? Enemies? A missing friend? A bad guy? (Grades 4 & 5) Write an entire story about this character and his adventure in the forest. The hidden surprises in this picture could inspire a very creative and imaginative story! Is there anything strange about this picture? Although the rock, which the woman is sitting on, is shown reflected in the water, the woman herself is NOT reflected in the water. My thoughts fly up like birds in the sky. And a tiny flower growing in the desert. I see cities and highways and a fallen tree. I see a grandmother telling a story to a child. But my thoughts fly up like the birds in the sky. When you sit quietly; where do your thoughts go? Create pictures showing woods reflected in the water. Divide the paper horizontally, to form the edge of the shoreline. There should be grass, or possibly reeds or cattails on the waters edge. There might be a few large rocks close to the shore. Maybe the woods are higher than the shoreline. A few of the Fir trees might have their trunks visible, while other tree trunks would be completely covered by their boughs. The arrangement of the woods is very important because a mirrored reflection needs to be reflected in the water. Create a reflected shoreline picture with a house and a yard, kids playing and maybe even a dog. Create paper birds that hang from a string. Bring in books from the library and show and discuss a few types of birds found in our area. Discuss how each side of the bird is the same (SYMMETRICAL) A wing and even a bird’s eye is found on each side of its body. Fold a sheet of white construction paper (or white cardstock) in half and let the kids draw a bird in flight, on the fold, so that when they cut their bird out, it will be the same on each side. This is a good chance to discuss SYMMETRICAL BALANCE. Remember, if you give them a bird already cut out, you will be taking away the chance for them to be creative themselves. You might draw a simple outline on the board, for them to copy on their paper. Give them more than one choice of ways to draw a tail, a head and/or the wings. If you feel you can’t draw that well, that’s great! Keep the drawing as simple as possible, so the kids will not be intimidated, as long as your bird shape ROUGHLY resembles a bird! Be sure to paint or color the bird. Pass out paper squares and the following instructions to let 4th and 5th grade classes fold a bird with flapping wings. Makes copies of this poem to hand out to the class. What is this a picture of? The first and most obvious picture shows blue butterflies, black and yellow butterflies, various leaves, pine needles, rocks and gravel. An arrowhead is in the right FOREGROUND. The arrowhead is a clue about the other picture hidden in this camouflage painting. The second picture is a hidden portrait of a Native American warrior. His face fills up the center of the picture. The warrior’s face and most of his facial features are outlined in pine needles. Point out the outline of the warrior’s shoulders, neck, face and headpiece for the class. What do you think the artist meant by the title she chose for her painting? There is no right or wrong answer, this question is merely to encourage discussion and get the class thinking. Bev Doolittle’s camouflage art demands months of development, research of terrain and animal sketching. After developing the concept, she creates small “thumbnail” sketches, up to as many as fifty, where she reworks the image until she has achieved her idea. Next, she works out all the questions of detail in a larger pencil drawing. A color study (colored practice picture) comes next, to help her choose the colors that will add the most to her picture. Finally, Bev decides the size for the painting and begins to paint. It takes long weeks of intensive work to complete an original Bev Doolittle watercolor painting. 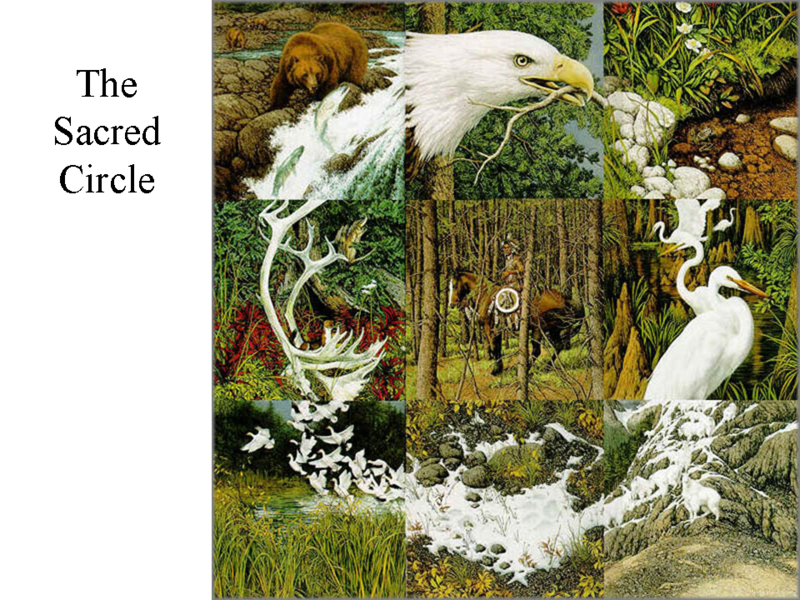 Did Bev Doolittle make you think when you looked at her painting? An original Bev Doolittle painting sells for thousands of dollars. Now that you know how many steps it takes her to create one of her watercolors, do you think that is fair? Bev Doolittle’s work is so famous because of the wonderful detail work she creates. This obviously takes a lot of time. Most people appreciate the amount of time it took to create such beautiful work, even though they can only afford to buy her artwork in a Calendar or a book. Collect a large sack full of long, dry, pine needles. Give each student a handful or two of the pine needles. Glue these needles to a construction paper background to create a picture of something, using the pine needles to create the LINE of the picture. Be sure to create an example so the class will understand what you want them to construct. This is not intended to be a hidden or camouflage project. The class will just use a unique and interesting MEDIUM (real pine needles) to create a picture. Be sure the class understands that the picture can be of anything this unusual medium inspires. Bring in a collection of natural “found objects” (leaves, pebbles, shells, rocks, thistles, twigs, pine cones, sand). Create an ASSEMBLAGE sculpture in a shallow cardboard box, a shoe box or a shoebox lid. Check Grocery stores to find boxes that have been cut down to an inch or two, for display purposes. They are usually happy to recycle this type of box for the use of a school art project. Create paper butterflies. This is a fairly simple project that every grade can enjoy. Bring in photographs or books showing real butterflies. Briefly discuss the life cycle of a butterfly (it’s great to throw in a little science). A butterfly can become a great and simple lesson on SYMMETRICAL BALANCE. Just spend a couple of minutes pointing out how the PATTERN on a butterfly’s wings is a mirror image of each wing. Have younger kids repeat the word; this will help them remember it. Ask older kids if they can define the word for you, before you begin the short discussion of the topic. What type of atmosphere is pictured here (MOOD)? The background sky is dark and stormy, it looks like it is about to rumble with the sounds of thunder and lightening. In front of the medicine man we can see some large rocks lining the edge of a water hole… or is it a water hole??? The right FOREGROUND of the picture shows green grass, which gives us a clue that there really is water here. The grass around the other areas of the picture is a drier, yellow color. At first this scene appears to be just a rare water hole out on the dry prairie. But as we look longer at the reflections in the water, the rocks turn into Buffalo, drinking water at the edge of the watering hole. Can you see them? The sudden appearance of the camouflaged Buffalo makes the painting seem kind of mysterious and magical. It makes you wonder whether, if there was suddenly a crash of lightening and thunder in that ominous sky, would the buffalo suddenly stampede? It also makes us look at the medicine man and wonder…How’d he do that? Although he did not know it, Cortéz had just set eyes on one of the most common animals in the New World. In the early 1500’s, there were more than 60 million of these creatures roaming the Great Plains of North America. The American Indian tribes knew them well, and depended on them for food, clothing, and shelter. The European settlers would come to know them too, and would call them buffalo. The Spanish explorer Coronado, whose soldiers were the first white men to see the buffalo wild on the Plains, admired the way in which the Indians used not just the meat but the whole animal. Coronado wrote, “With the skins they build their tents, clothe themselves, make ropes and get wool.” He also noted that the Indians used buffalo horns, hooves, and bladders to make tools and containers. The Indians even collected dried buffalo dung, or “chips”, to burn for fuel because firewood was so scarce on the Plains. Indians did not believe in killing animals for sport, only for survival. Draw a buffalo with charcoal. Paint a watercolor prairie landscape. Paint the prairie grass with golds and yellows. Paint gray rocks, next to a watering hole. Paint a dark sky, about to rain or even having a lightening storm. Cut buffalo from construction paper and glue to the landscape. Cut a buffalo skull and glue it somewhere in the picture. Cut the buffalo for your painted landscape from fake fur and construction paper. Sculpt a buffalo from clay. Use line to create the texture of fur. Native Americans used every part of the buffalo to sustain their way of life. This is a springtime picture. A bear is lying on some rocks, in a patch of green with flowers, surrounded by white. The bear looks us straight in the eyes. Can anyone find a beetle in this picture? In the center of the yellow flower, on the left middle ground What other kinds of bugs or insects can you find in this picture? There are butterflies and bees fluttering all around the bear, but he just lazily stares off into space. The bear seems to be enjoying the warm spring sunshine. The FOREGROUND shows large flowers and larger insects. The artist has made it seem as if we are lying in the grass, just in front of the bear, and the larger flowers are right in front of us. Look how Bev has created texture on the bear. It seems as if she has painted each individual hair of the bear’s fur. His fur is so realistic, it makes us want to reach out and touch it! Create a Bumblebee gluing 3 black and 2 yellow pompoms together. Make cellophane wings and glue on wiggle eyes. Glue on Safety pins (you should do this for them with hot glue) so younger kids can wear them. Have kids create bugs with pompoms, pipe cleaners, cellophane and wiggle eyes. Challenge kids to create a new type of bug that hasn’t been discovered yet. Tie a 12” piece of fishing line around the bugs so the kids can carry them and they will look like they are jumping or flying. Bring in squares of brown fur. Kids should draw a bear shape on the back side of the fur, and then cut this out. Glue the shape to a background. Show the kids pictures of bears and have them draw and paint a bear.